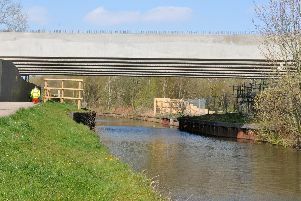 One of the more impressive feats of engineering to take place in Wigan in recent years has been unfolding largely away from the public gaze this week. Beams for the first of three bridges that will carry the A49 link road from Westwood Park to Goose Green were gently lowered into place by giant cranes on Monday and Tuesday across supports on either side of the Leeds and Liverpool Canal next to Scotman’s Flash. Measuring 35m and weighing in at a hefty 70.5 tonnes each, the concrete “girders” were brought to the site on huge articulated lorries. A further two bridges will be installed in the coming months: one over Poolstock Lane and another spanning Smithy Brook. Work is being carried out by Jones Bros Civil Engineering UK and this section of what was once going to be called the A5225 is set to be completed in about a year’s time. 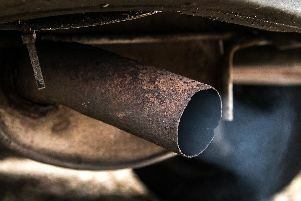 The aim is to relieve traffic on various existing main roads, including Poolstock Lane, and ultimately it is hoped by supporters to have the route travel all the way from Chapel Lane in Wigan town centre up to the M6/M58 junction at Orrell. And it has still not been completely ruled out that the A5225’s original trajectory eastwards going all the way to the Westhoughton junction of the M61 will be created eventually too. Jones Bros has been supporting other local companies by acquiring office space with Office Bay in Westwood Park, working with Paul Blackledge Drilling and using security and cleaning services from another Wigan-base business, Radius. They have also held apprenticeship recruitment events at Wigan and Leigh College to give local young people a chance to work on the scheme. Wigan Council has promised to keep the public updated with the future progress of the link road and particularly the Poolstock bridge which will inevitably cause traffic disruption. Becca Heron, director for economy and skills at Wigan Council, said: “The A49 scheme has reached its first milestone with Jones Bros now installing the first beams in preparation for the first bridge being erected. The installation of the beams means that the bridge over the canal adjacent to Scotman’s Flash is one step closer. “There will be another two bridges installed throughout the duration of the scheme, one over Poolstock Lane and one over Smithy Brook. “Jones Bros have a wealth of experience in this field and are working closely with Wigan based businesses to deliver the A49 link road.